ALAMEDA POINT, Calif. — California’s first small batch barley floor-malting facility to open since Prohibition, Admiral Maltings harkens back to the days when malt houses sourced local barley for regional breweries and distilleries. With their traditional, yet state of the art 20,000 square feet facility now in full production, Admiral Maltings officially announces the opening of their new onsite pub overlooking the malt production, The Rake. The Rake will exclusively serve beers brewed with Admiral malts, featuring 20 beers on draft and two cask-conditioned ales all accompanied with rustic, honest pub food. For the first time ever, beer aficionados can watch the malting process while enjoying beers brewed with the very malt produced onsite, only at Admiral Maltings. Reflecting elements of Alameda’s rich history, the mid 1940’s-era former dry goods Navy warehouse has been transformed to house Admiral Maltings and its companion pub. The Rake utilizes its original Douglas fur timber ceiling beams while local Alameda railway tracks from the Transcontinental Railroad make up the base of The Rake’s bar. Banquette seating is constructed with reclaimed virgin old growth redwood. Five window snugs fitted with tables and seating overlook the floor malting action. Ben Frombgen and Gamut directed the pub design; reclaimed siding is used for the bar facade; original industrial and modern fixtures are throughout the interior; and the bar top is metal with wooden edges. The Rake is 2,000 square feet of pure malt-beer heaven with a full-service kitchen and 150-person capacity. The Rake offers comfort-driven menu items served in a warm, welcoming dining environment. Those coming for the food can expect outstanding cured meats, cheese boards, sandwiches (Reuben, Italian hoagie), and snacks such as smoked whitefish toast, pickled quail eggs, and more. The Rake’s food menu will be released shortly before its official opening on January 26. Since the opening of Admiral Maltings on August 25, 2017, an array of the Bay Area’s most acclaimed breweries have released craft beers brewed with Admiral’s premium malt produced with 100% sustainably grown barley from California family farms. With upwards of 50 breweries and distilleries purchasing Admiral malts in just the past four months, many exceptional beers have already hit the market, including Russian River’s Key Grip (English/American Hoppy Pale Ale, 5.5% ABV), Anchor’s Admiral Nelson Ale (6.9% ABV), Cellarmaker’s Double Dry-Hopped Questionable Origins #4 (Hoppy Pale Ale, 5.5% ABV), Almanac and ThirstyBear’s collaboration Hazy Voyage (Hazy IPA, 7.8% ABV), Magnolia’s Admiral Ashbury (Blonde Ale, 4.7% ABV) and Old and in the Haight (20th Anniversary Strong Golden Ale, 8.4% ABV), Faction’s McCrary Pale (Pale Ale, 5.9% ABV) and many, many others. 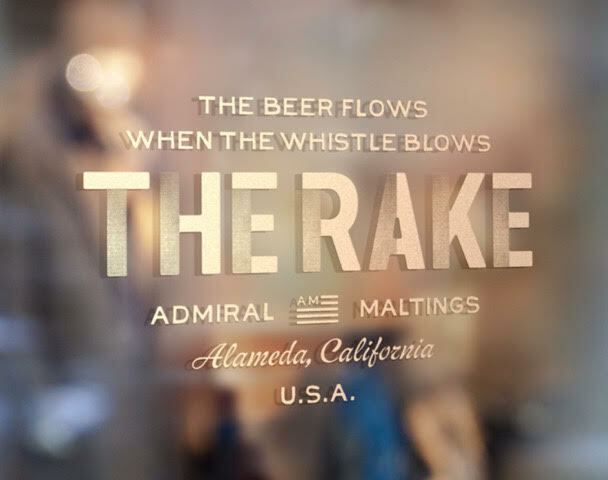 On Wednesday, January 24, 2018, Admiral Maltings invites the media to their Alameda Point facility for an Exclusive Press-Only sneak peak of The Rake and tour of Admiral Maltings. From 6:30pm – 8:30pm, join the stalwart craft beer and malt experts behind Admiral Maltings for a special tasting event. To RSVP, please email Jesse P. Cutler at press@jpcutlermedia.com by Friday, January 19. Admiral Maltings co-founders Ron Silberstein (Owner, ThirstyBear Organic Brewery), Dave McLean (Founding Brewmaster, Magnolia Brewing Company), and Curtis Davenport (Head Maltster) are available for interviews. Admiral Maltings produces premium, freshly kilned malt using traditional floor-malting methods and sustainably grown, locally sourced grain. With our focus on process, terroir and grain variety, Admiral Maltings seeks to meet the changing demands of a growing craft beer and spirits industry by offering creativity, choice and innovation to craft brewers and distillers. Admiral Maltings fosters a robust connection between craft brewers and distillers and their local agricultural community.